surf lesson, surf equipment, schooling and everything else in their power to them. 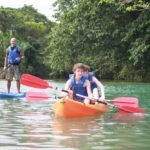 have a mission to teach as many children as possible survival skills in the water. These specialised skills will aid babies and children to orient themselves in the water and self rescue. More than two persons every minute die from drowning every year around the globe. From that more than 50 per cent are children, including children who can swim. Children Of The Water intention is to help prevent the tragedy of drowning through education, training and fun, and help those around the world who would otherwise not have the opportunity to learn these skills. uses direct action tactics to protect marine life. lack of more aggressive intervention. authentic handmade textile and the ocean. Find out about the Happykini and Feel goodies. Swimwear and accessories with a story. Real products. Made by real people. Everything in the village is in walking distance, but if you would like to go for some sightseeing outside the village, you may want to rent a bike. Please, always wear helmets (for your own safety), since the Police will check this regularly. If you would like to go out for dinner; Then “The Bukit Cafe” is a great place to go to for some fusion Balinese food; breakfast, lunch and dinner. Location: Jalan Melasti Labuan Sait Pecatu, At the The local night market nearby and at ‘warung’s” have plenty of nice local food for great prices. Ofcourse there is also the possibility to cook your own meal in the kitchen. If you would like a more deeper relaxation while staying here, you may ask Wayan to book a massage for you at the house. For surf lessons, surf coaching and surf safari’s please let us know what you would love to inquire with the inquiry form. You fly into Bali Denpasar Airport. From the airport theres a free transfer to Laksmi Villa offered. About short 45 minute drive. Hossegor is one of the best surfspots in the country and the area is a paradise for surfers. Hossegor is a beautiful and developed town, with great restaurants, nice bars and very attractive shops. The beaches of Hossegor are almost endless, as are the waves. With nicely kept showers and toilets along the boulevard, this place adds some comfort to the beach and surf vacation. If you’re not to go surfing, it’s easy to lose yourself shopping if you’re into surf- and lifestyle brands. Hossegor is the home of most of the surfminded brands in Europe and you can easily spend a day at their outlets. Nice places to visit in the area for surfing as well as sightseeing, shopping and a nice night out include Capbreton and Seignosse. Hossegor will accommodate for a perfect surftrip for your family, and it will add a tint of class for those seeking to combine surfing with luxury! Surf lessons and surf coaching is available, please let us know with your inquiry if you would want to take any lessons. Especially during summer surf lessons are very popular and easily booked out.